With this filter design, Burgess Optical has not only improved upon the color filter - we have reinvented filter technology. The VDC Filters utilize no color glass, but instead rely upon advanced technology and dielectric coatings. The standard color filters that have been used for over a century allowed very limited filtering of specific wavelengths of light. With the VDC Filter, there is an infinite range of filter brightness and wavelength. 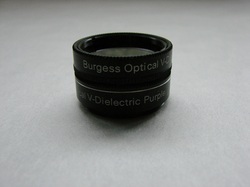 Burgess Optical will have the VDC Filter Series available in 425nm - 650nm in 25nm increments and several special dual peaked versions. The VDC Filters have a variable transmission rate from approximately 45% to 90% transmission giving them unlimited astronomy use. The VDC Filters will be available in 1.25" and 2" sizes. First in the special dual peaked series of VDC Filters. Peaks are at 475nm and 650nm. This gives the effect of 2 color filters being utilized at the same time without canceling out each other and while maintaining full variable adjustment. The VDP Filter has unlimited uses in planetary viewing, double star viewing, nebula viewing and more. The VFA Adapters allow the user to adjust the variable filter while it is inside the telescope. Model A Unit - With the Model A Unit the eyepiece is rotated while the filter remains stationery. Model B Unit - With the Model B Unit the user turns the filter via a small thumb wheel located along the top edge of the adapter.